Established in the late 1800s along with four other parks, MacRae is located on a bluff overlooking the Raccoon River and has a commanding view of Downtown Des Moines. Also located in the higher portion of the park is one of the few remaining savanna remnants in Iowa. The park has an enclosed shelter that can be reserved for events, a lagoon with water feature, tennis courts and playground. An open-air shelter is also available on a first-come, first-served basis. – Evan Shaw donated design services for a new natural playscape that will allow for fundraising of the new play feature at the south end of the park. – Received a $300,000 Iowa DNR REAP Grant to perform the following improvements to the park: Trail connection between the park and Meredith Trail was completed fall 2015. – Woodland restoration and prairie reconstruction – underway and will continue through 2017. 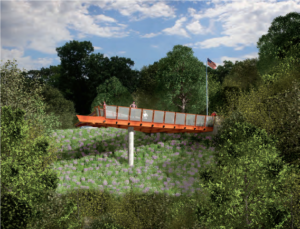 Nature trail – 2016 construction is planned. Enclosed shelter renovation – $350,000 budgeted, design to occur in winter 2016 and construction in 2017. – The city will begin removal of nearly 100 trees that are no longer healthy clearing room for the next generation of trees and protecting the existing large trees within the park. 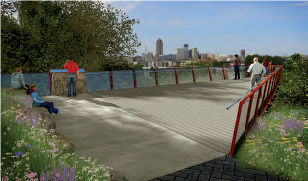 For more information including the parks history and additional details of improvements to revitalize this historic park on the Southside, please visit the City of Des Moines Parks and Recreation page.